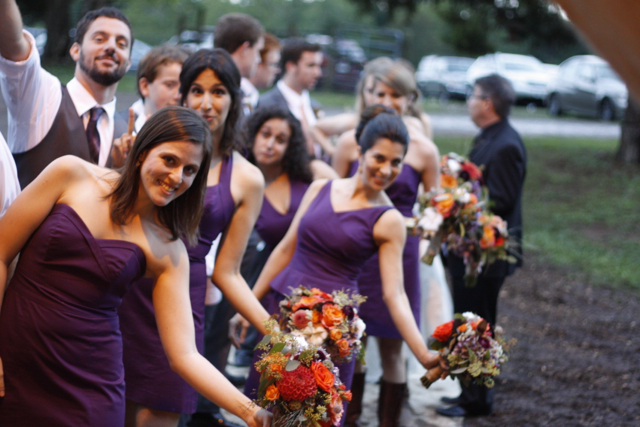 Just two short years ago I provided flowers for a beautiful bride named Laura. Laura was my sunflower bride. Early this year Laura’s mom Mrs. Magill, called to say that her other daughter Alice was getting married and she wanted my help. 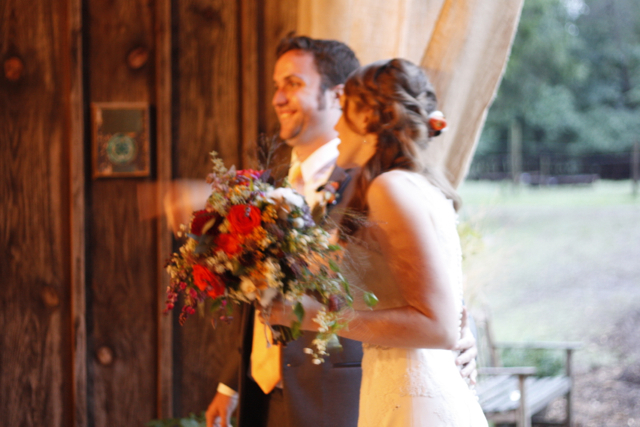 Alice and Mike met and began dating while working for Teach For America in Mississippi. 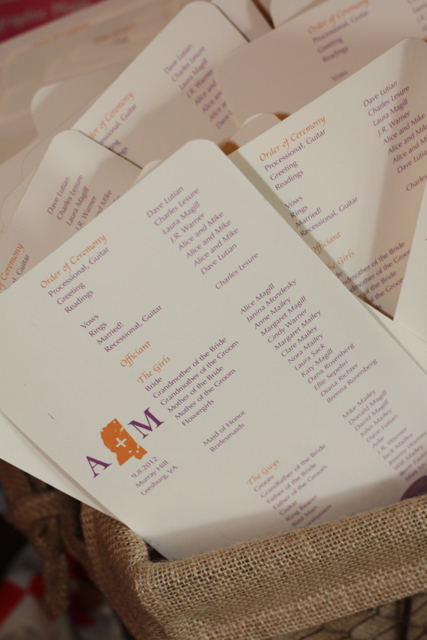 Because of this, the couple hoped to have a wedding that reflected their time spent in Mississippi. 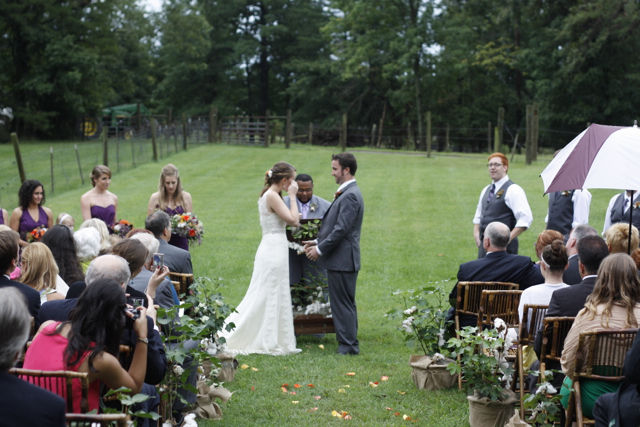 Alice and Mike wanted a very rustic country wedding with a super southern feel, they also hoped to find a barn in Loudoun County where they could marry. 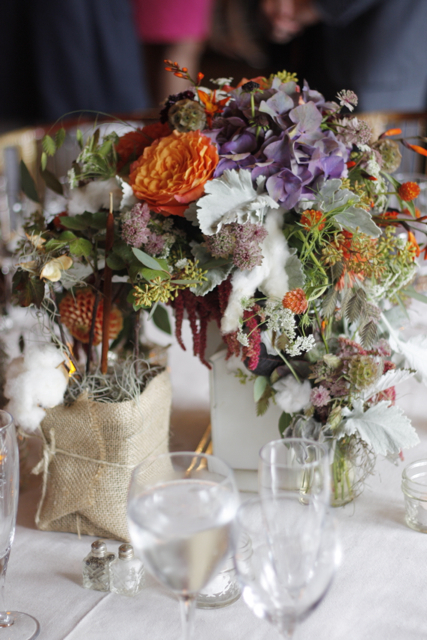 Thankfully I was asked to provide the flowers, and I was asked to completely design, style, and plan Alice’s wedding, and that is how Alice became my cotton bride. Their wedding will always be one of my absolute favorites because its mine from beginning to end, this wedding has the Holly & Evan mark all over it. 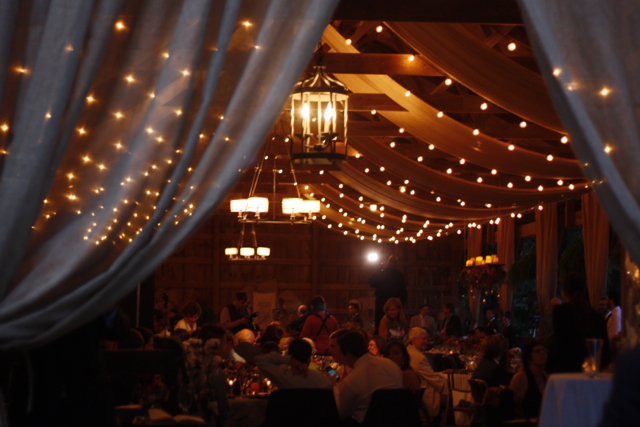 The first awesome recommendation I gave, was for a wedding venue. 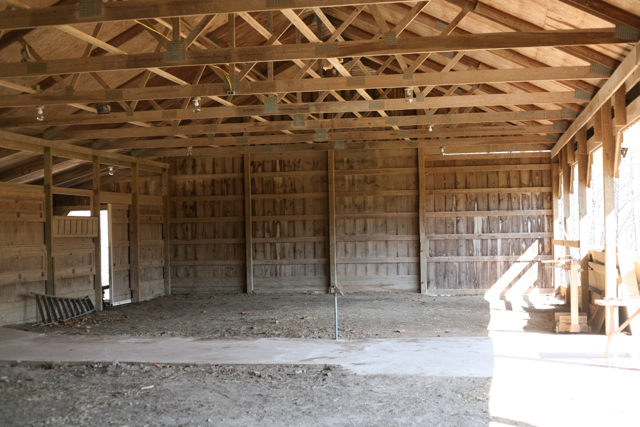 I suggested the SOON TO BE wedding barn at Murray Hill. 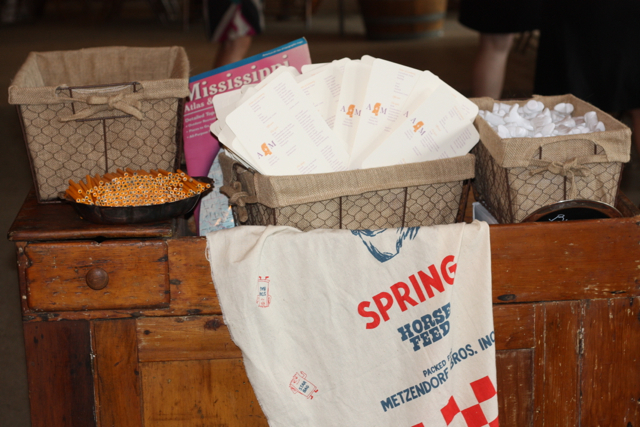 When the family arrived to see the venue there were actually horses still in the barn. 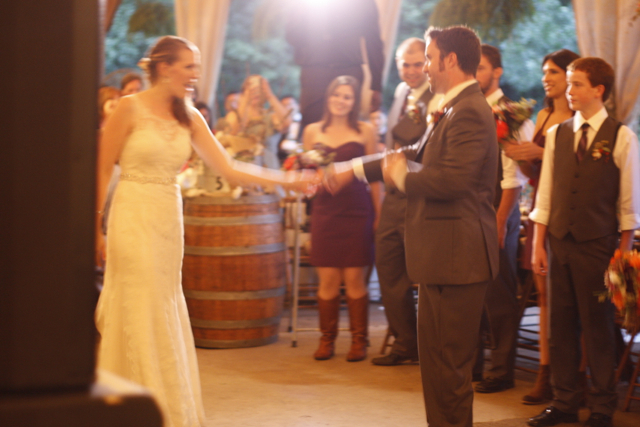 Because the family booked the venue and did not run screaming from the barn, I knew we were going to be a great match. Talk about faith!!! 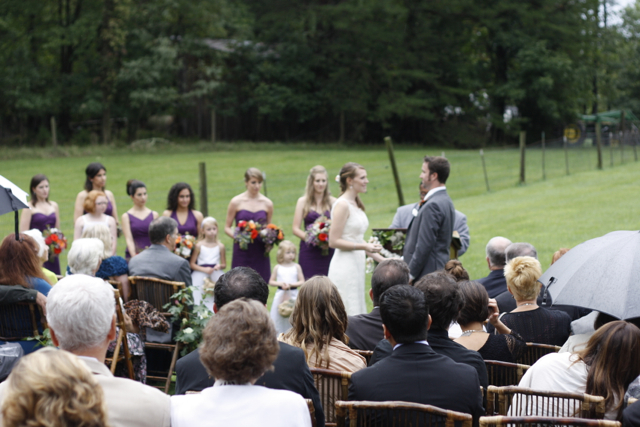 Shortly after they found their fabulous barn we had a serious conversation about the look and style of the wedding. 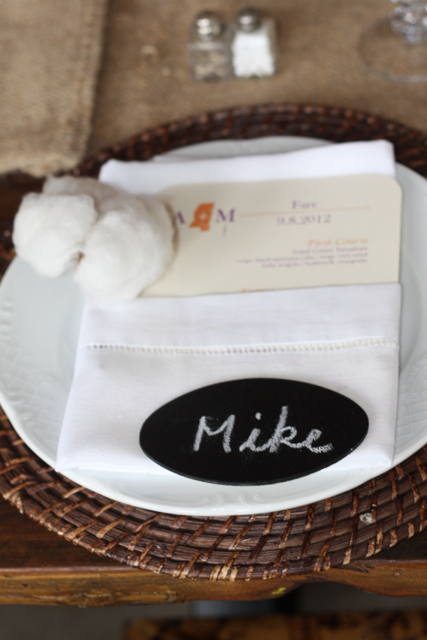 One thing was for certain, this wedding was going to feature cotton. My next super awesome referral was to send them to my past bride Rachel Merkle. 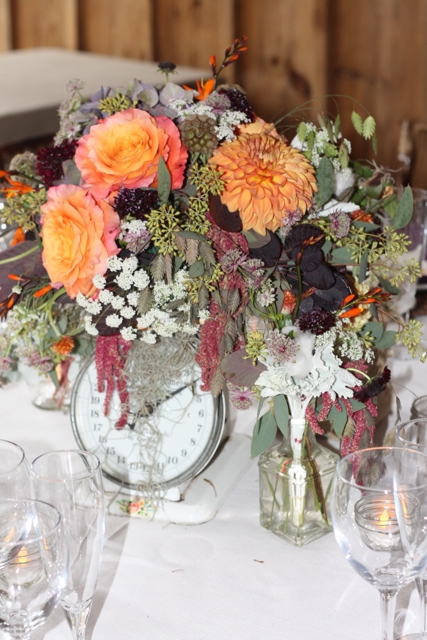 Rachel is a graphic designer and Rachel is also the designer that created The Full Bouquet. 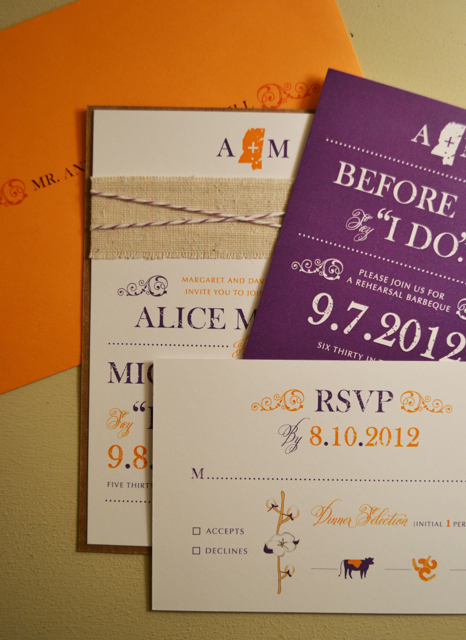 Alice, and Mike, worked with Rachel to create the below invitations. I should also note that Rachel is doing the invitations fro my sons wedding. Go Rachel!!! 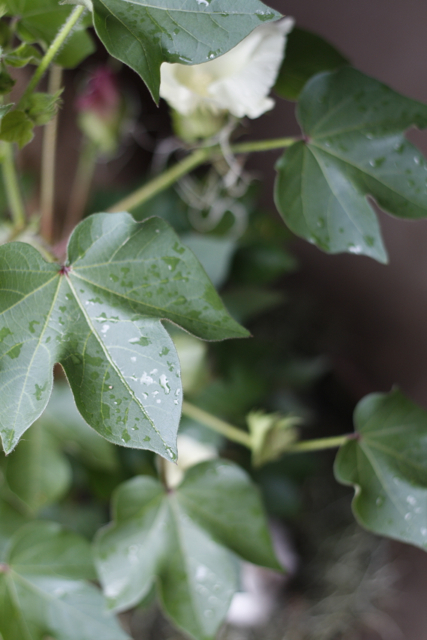 Next I had to find the cotton seeds that Evan and I had been given last October. The seeds were given to us by of our other past clients. Little did I know that I would be needing those seeds a year later. 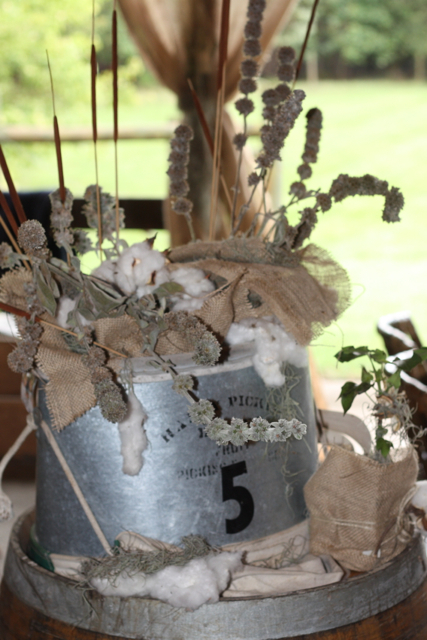 If cotton was going to be used in this wedding, I wanted to bring it to life and I meant literally. I wanted a new fresh interpretation of the use of cotton. 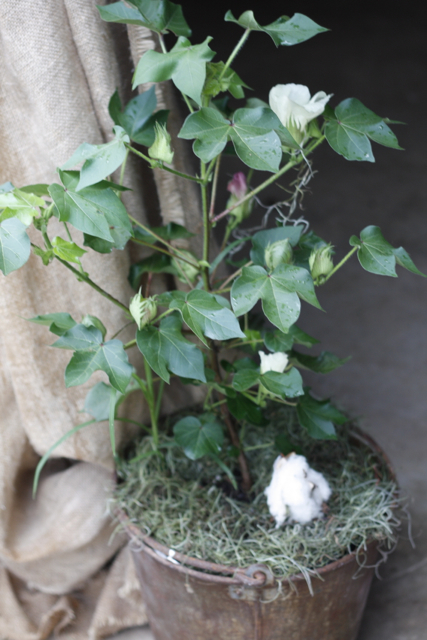 So in the early spring Evan started over 40 cotton plants. 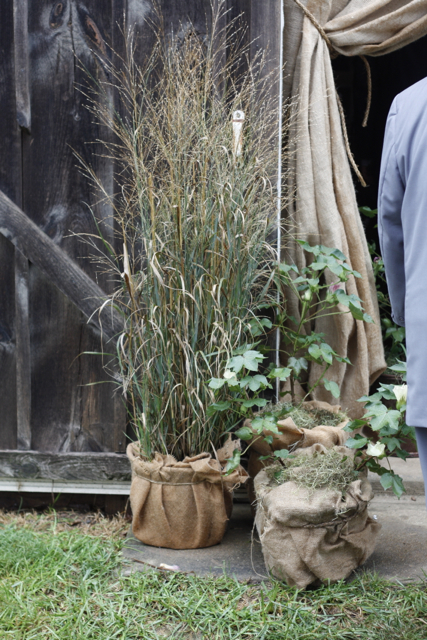 The plants were nourished, tended to, and guarded for the entire growing season. 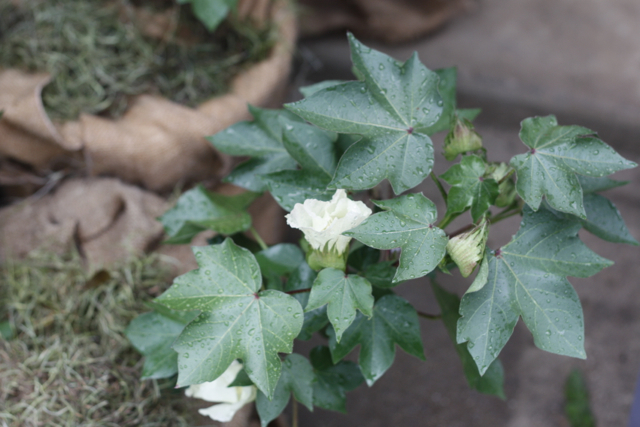 Much to our delight the plants actually bloomed and even created cotton bolls. 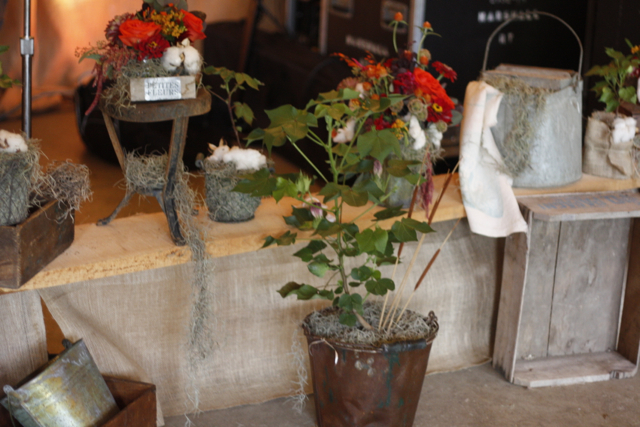 Yes we grew a total of 40 cotton plants in varying sizes for this wedding. I have seen cotton designs over the last few years and I really wanted what we created for this wedding to be unique and above and beyond, so yes, we grew our couple cotton. I know, it’s insanely cool right? 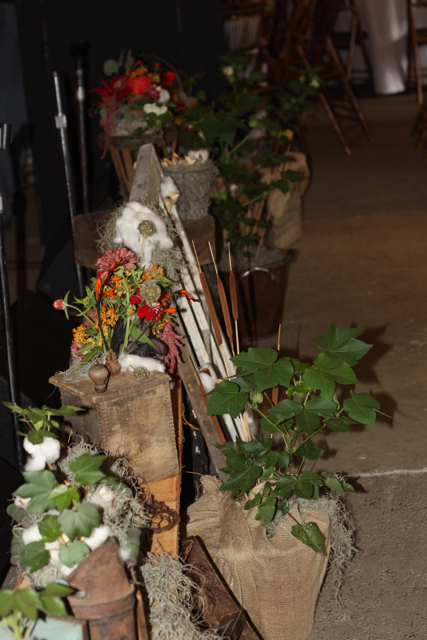 The cotton plants were used to decorate the aisle, and the barn, and mini cotton plants were even placed on the tables. 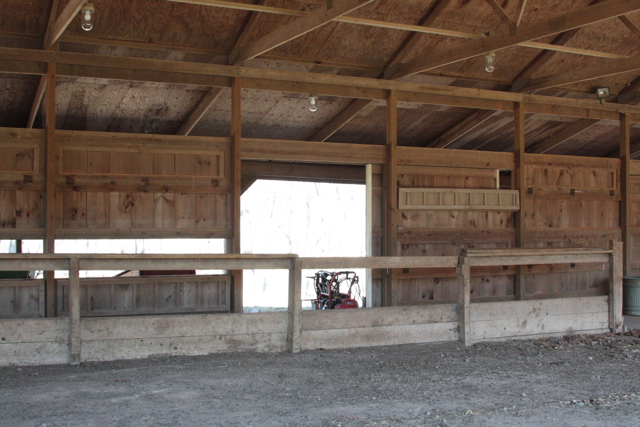 After Evan finished growing our couple cotton, he began designing the barn. 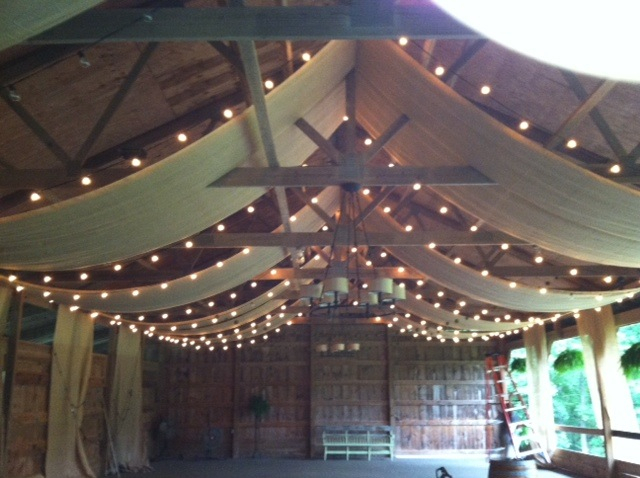 Here is a picture of the barn shortly after the horses left and just before the barn became a wedding venue. 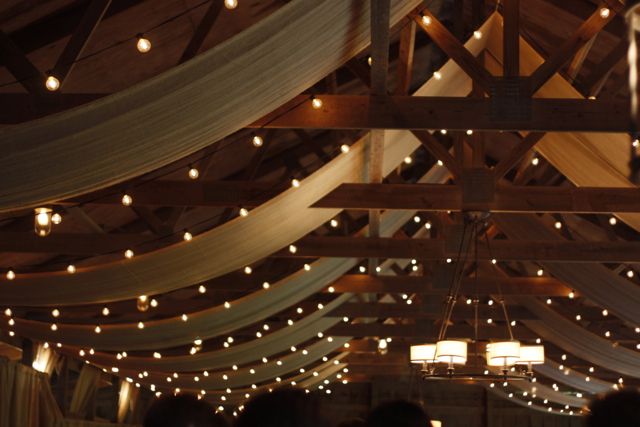 Evan began designing the barn by pulling huge rolls of burlap through the rafters of the barn, and then he added Edison lights. He also sewed curtains for the front door of the barn. 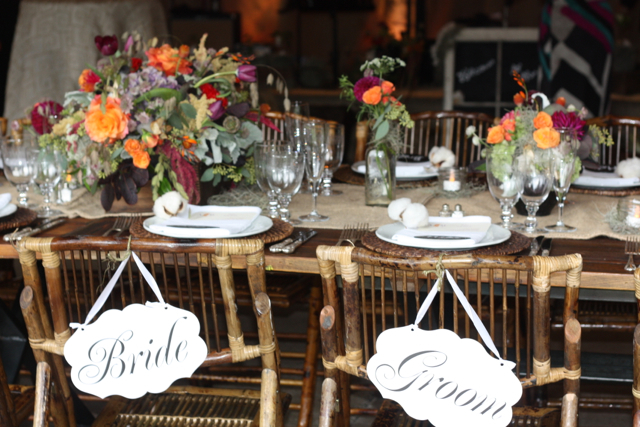 Yes, he sewed burlap curtains for our bride. I thought Evans efforts on this wedding were magical and amazing. 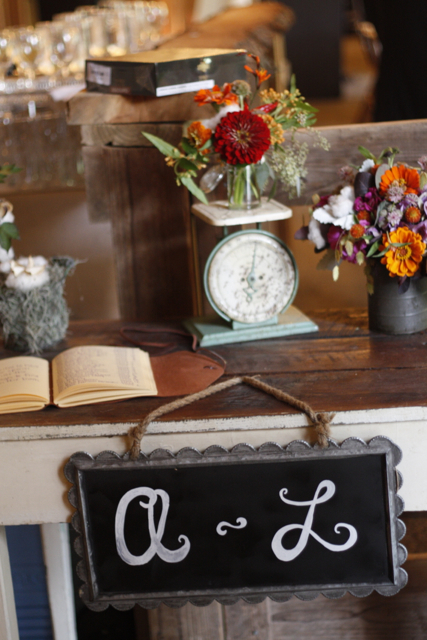 I will also say that I was constantly surprised by the many additional things Evan did for this wedding. 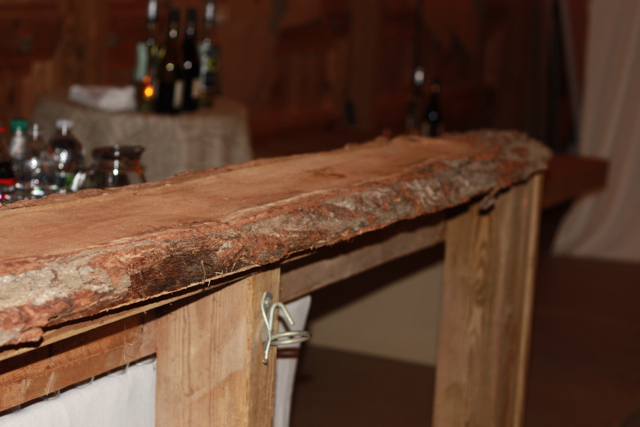 When I arrived at the barn I found that Evan had created a bar from a beautiful board we had found at a saw mill. This was a decor item that I didn’t even know he was doing. I loved this surprise. 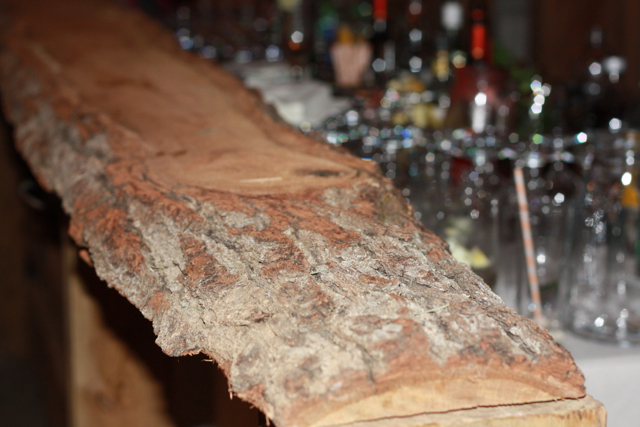 In addition to the bar Evan also created a 20 foot long bench in front of the band this was designed with old logs and lumber. 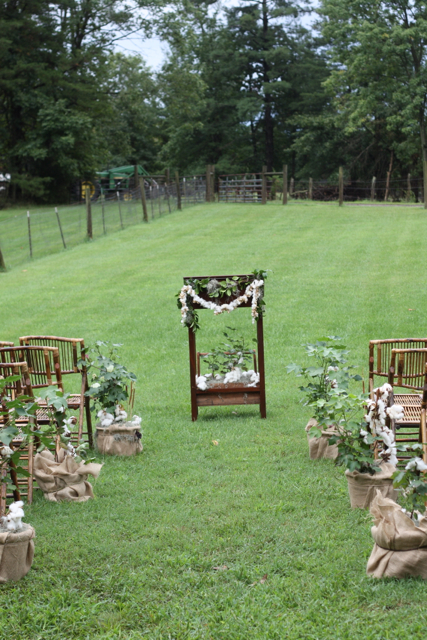 The bench also had a burlap fabric runner and it created a transition from the band to the dance floor. The bench also provided me a really fun area to style. Go Evan!!! The bench hid the wires and the equipment that the band had on the floor. 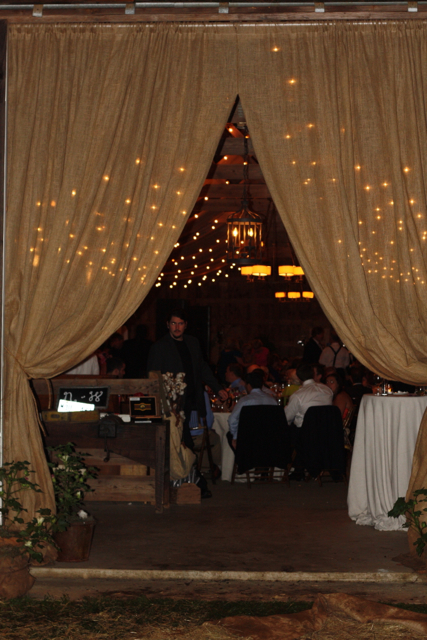 He also provided the band with up-lights and their very own burlap curtain backdrop. I will say it again, go Evan!!! 20 feet of beauty right in front of the band!!! 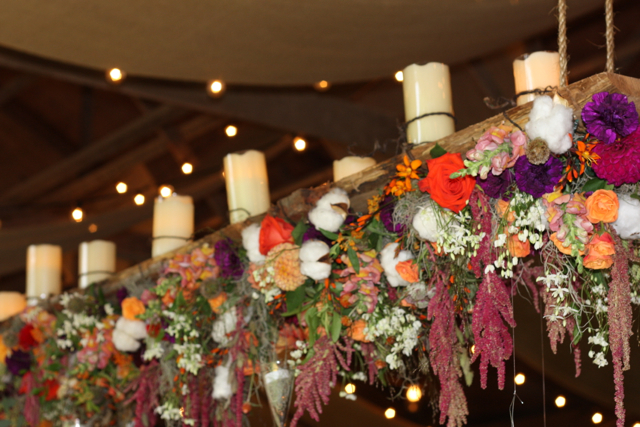 Perhaps my favorite detail of this wedding was my floral hanging chandelier. This was also created by Evan. Me and the flower shop girls did the flowers of course. Everywhere I turned I could see the hand of Evan. Having a handy man on the team is beyond important. When the weather turned to potentially dangerous, Evan chose to stay with us throughout the day. He provided tarps and shelter for the caterers. 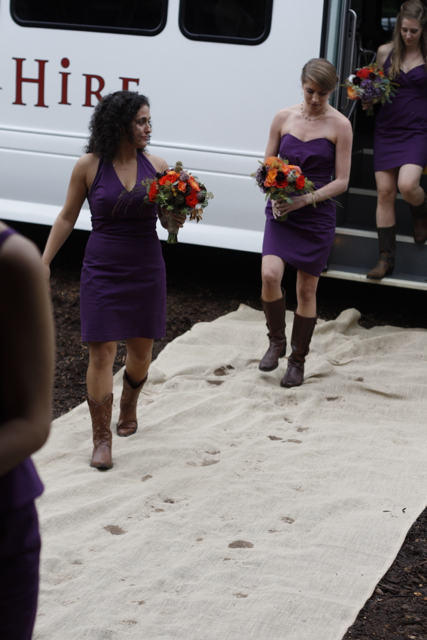 He even magically appeared with a burlap carpet just as the bus arrived with the bride and her wedding party. These were things I would have never thought of, but every time there was a need, Evan was there. 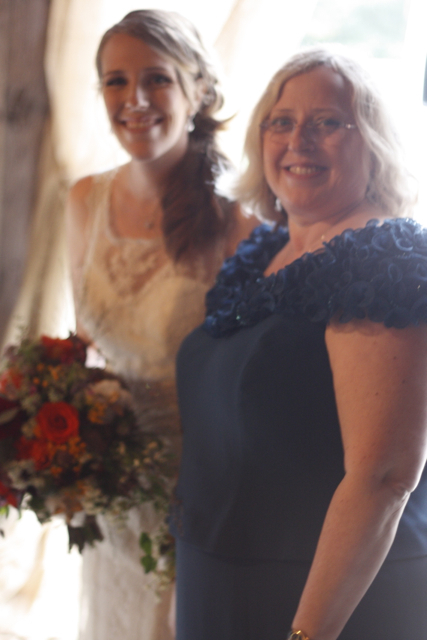 Here is my beautiful bride and her super lovely mom, this was just before Alice went down the aisle. Alice and Mike were truly fabulous on their wedding day. The couple had hoped to marry outside on a cliff that overlooked the Potomac River, but an enormous storm blew through the area an hour before their wedding. In fact the storm blew through just as Alice and Mike were on the porch of the mansion having their first look. 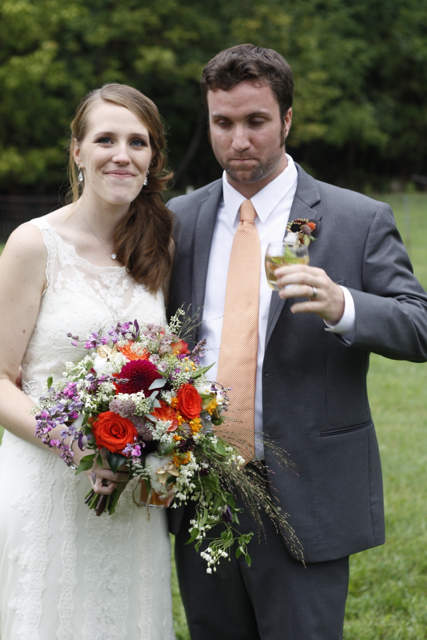 Seriously, their wedding day started with the two of them facing an incredible storm on the porch of the manor home. I literally watched the screens blow right off the porch as they had their first look. The storm was insane, but somehow all of this was oddly beautiful. I guess in truth, it was Alice and Mike that were beautiful. Never once did they complain about the weather, and never once did they falter. 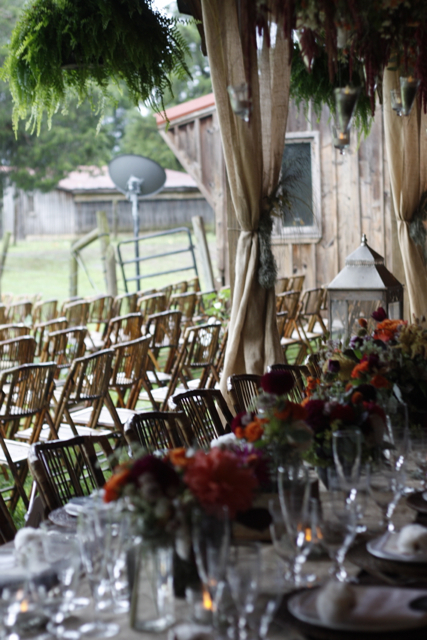 They believed they would have their outdoor wedding and being committed to that goal, we changed the location of the ceremony to just outside of the barn. 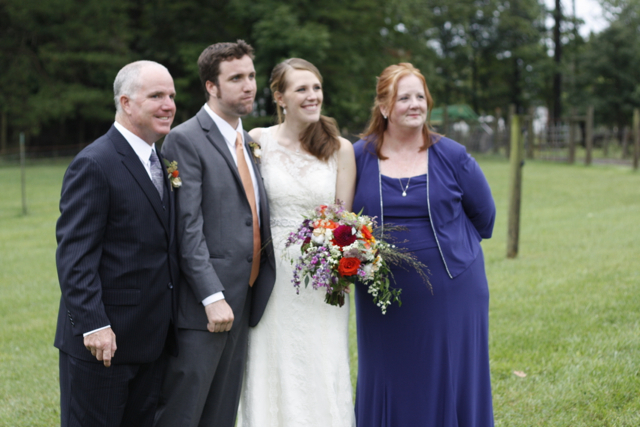 With the support of their family and a very determined and loving father of the bride, Alice and Mike met in a gently falling rain and married outside. 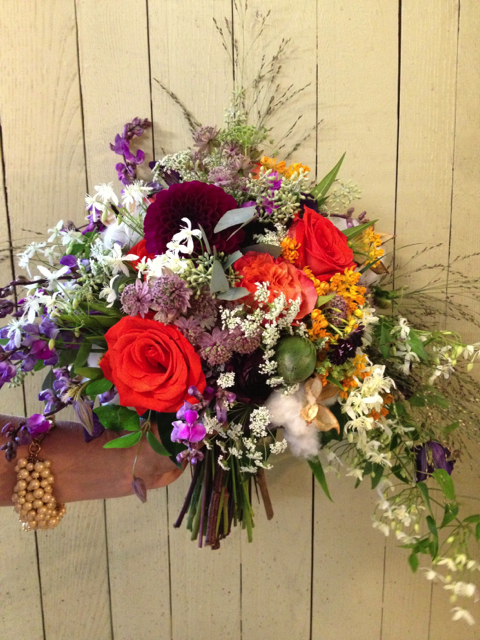 Alice’s bouquet was created with free spirit roses, santana roses, astrantia, queen annes lace, cotton bolls from the cotton we grew, cotton pods and full open cotton, dahlias, two types of clematis from my garden, hyacinth bean flowers from my garden, ornamental grasses, and asclepias. 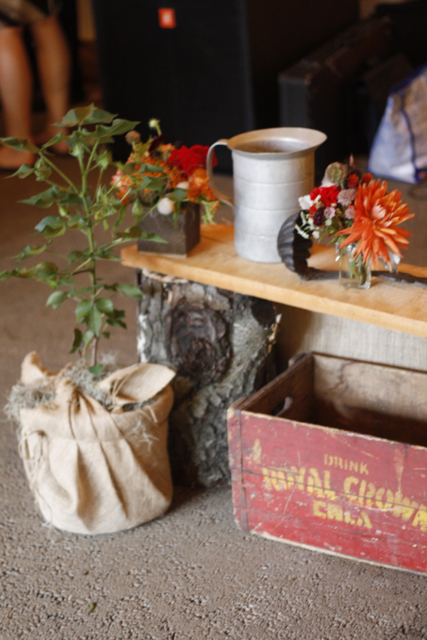 An old dry sink with programs, and bubbles was stationed at the end of the aisle. 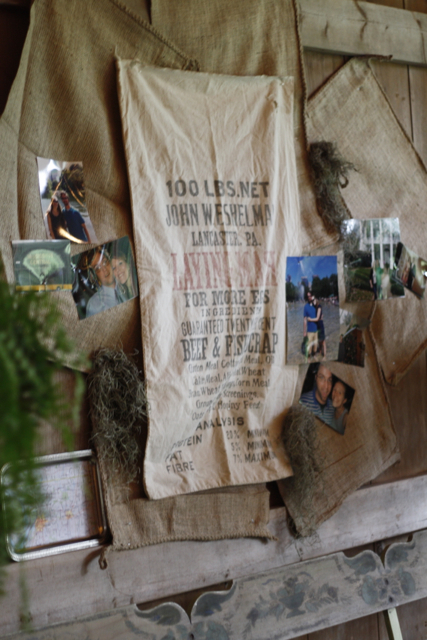 Inside the barn, the columns had been decorated with burlap, spanish moss, and ornamental grasses. 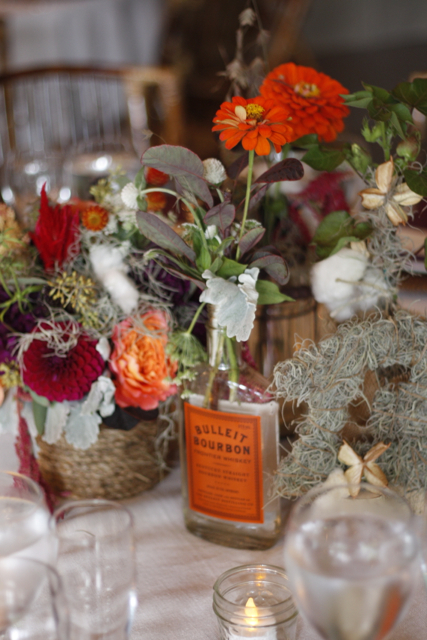 Tables were adorned with old liquor bottles, vintage scales, vases, boxes, and of course my flowers. 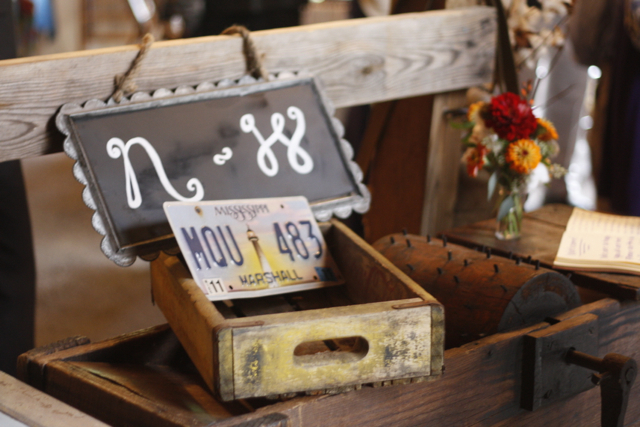 Table numbers were created by our studio out of spanish moss. We had a lot of fun creating those. Imagine cutting out card board numbers one -fifteen and covering them with moss. We then inserted the numbers into little birch stumps that Evan had made for us. 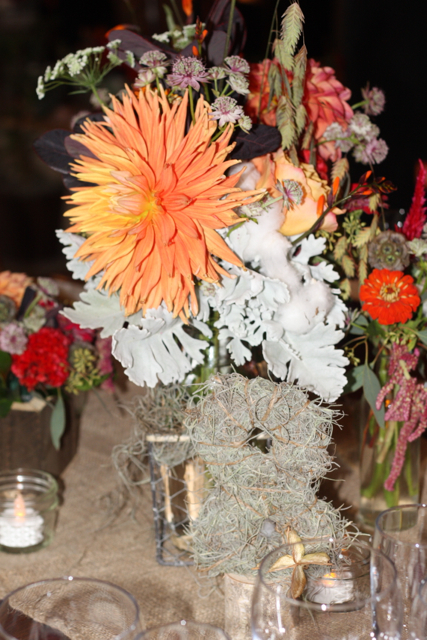 The head table was designed with multiple flower arrangements and our hanging floral design. 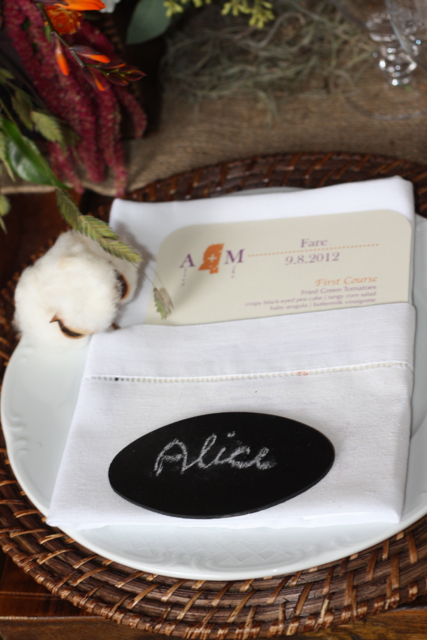 Each place setting featured a name card, and a napkin with a menu and a small little cotton boll. In a 911 rescue effort Rachel the stationery queen arrived with a second additional seating chart. With the change in ceremony location guests no longer had a cocktail hour to find their seats so I felt we needed a second area to provide a seating chart. I didn’t want the guests waiting in a long line so I was being proactive. 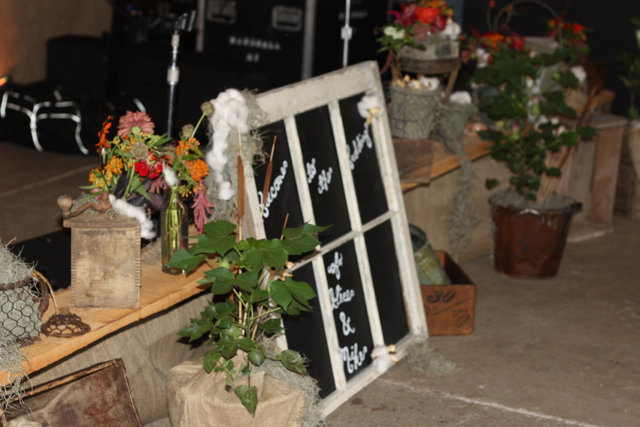 In another section of the barn, I had 3 tables or stations styled with beautiful flowers and props. 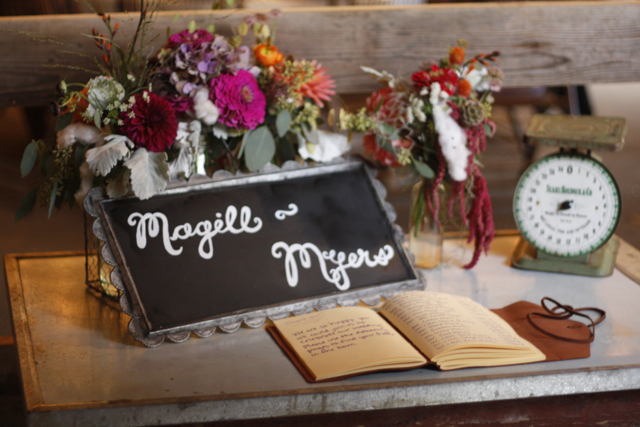 Each table held a leather bound mole skin book that held the guests seating assignments. These stations were created with old vintage tables from my antique booth at On A Whim Antiques, or from antiques from my home. In fact I even brought my vintage apple press or cotton gin. We are not quite sure what this piece of furniture was in its past life, but it is one of my favorite pieces and it was my birthday present from Evan 10 years ago. All over the barn there were awesome details and unique elements. I had been shopping for this wedding for almost an entire year. Shopping, growing, and planning. One of my favorite finds were these old orchard bags. 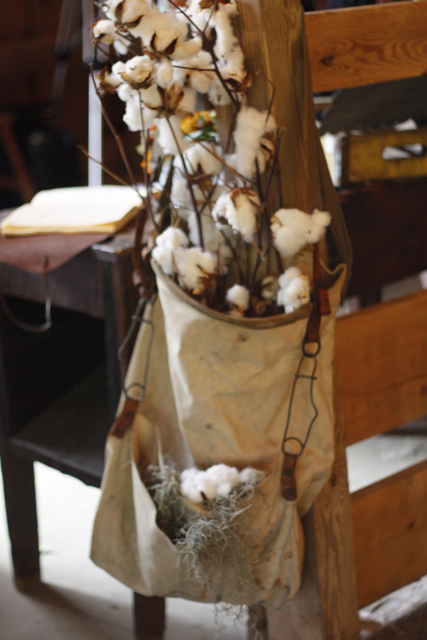 The bags were displayed with cotton, and burlap through the barn. 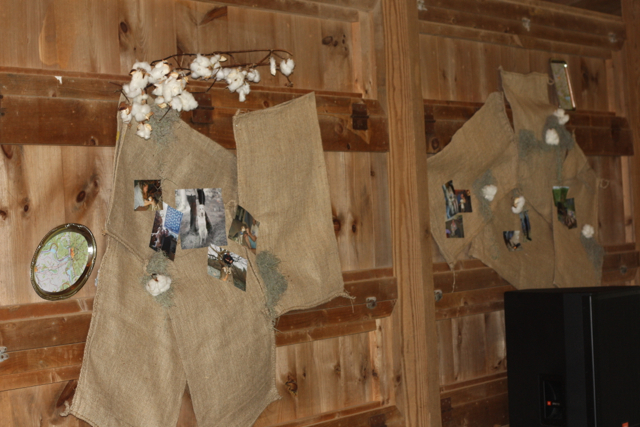 Burlap and vintage feed bags were used to decorate the walls of the barn. 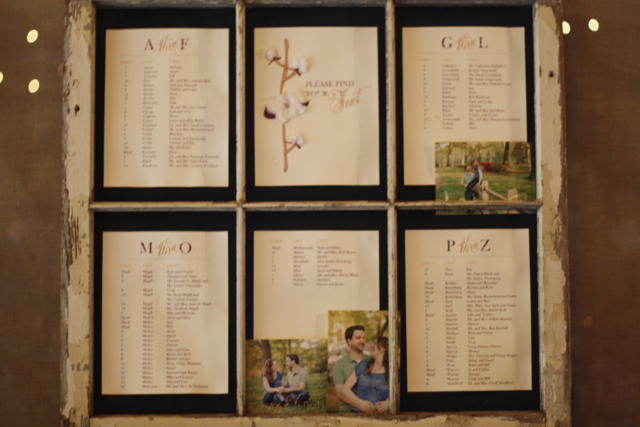 Alice gave us pictures of the couple and these were added to the walls of the barn. This was a super fun and personal accent. 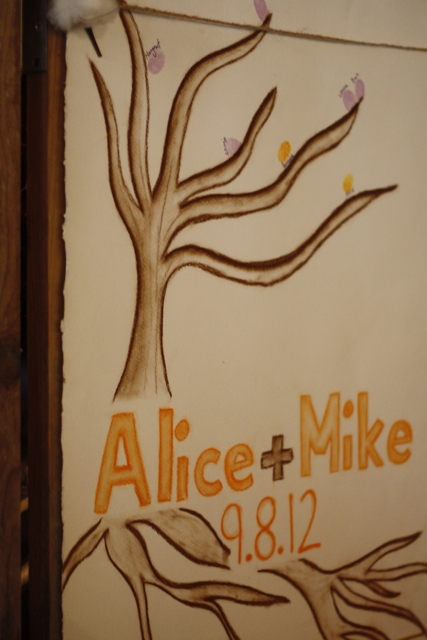 Alice also drew the above tree. Guests were asked to sign the tree and leave a leaf thumb print. By the end of the night the tree was full leaves. 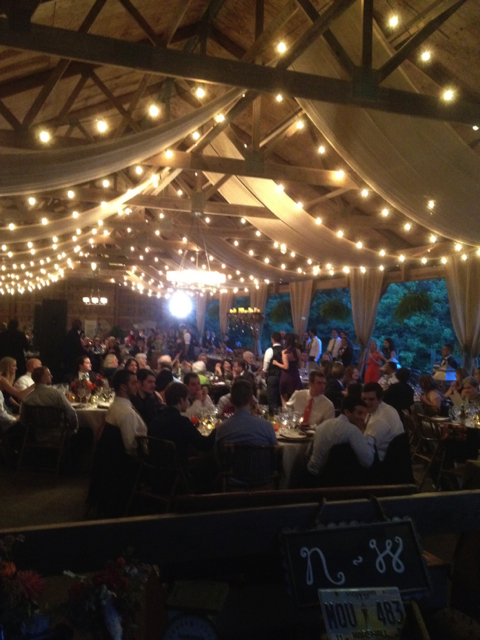 Was the wedding perfect, well yes it was. Perhaps a different kind of perfect than we all expected, but it was still perfect. Did I want a bright sunny day for this couple, you bet I did, I wanted it with all of my heart and soul. But as I watched them dance to this song, after just seeing them marry in the rain, it was clear that this wedding was just exactly as it was supposed to be. 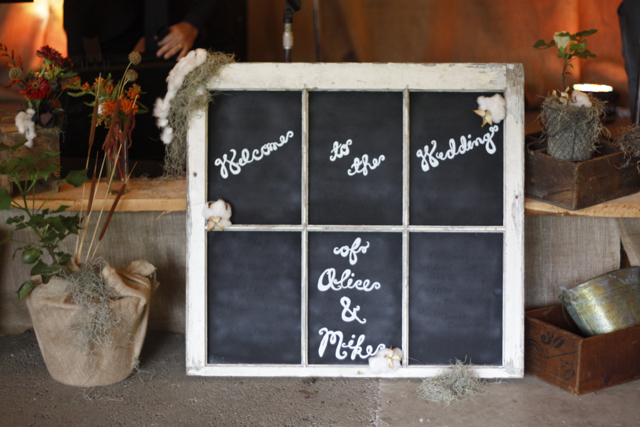 This wedding was perfect for Alice and Mike. This wedding day, this experience, is the beginning of their story. 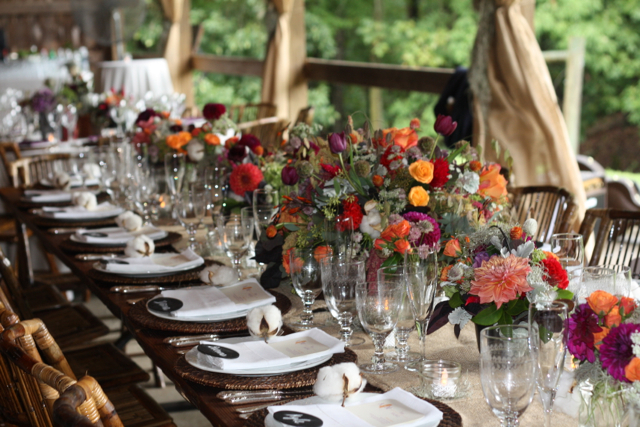 I must thank the fabulous Design Cuisine for the incredible service, and catering they provided for this family. I will always remember looking up and seeing 20 handsomely dressed servers all standing in a line ready to begin the dinner service. Those same people were with me just hours before as we began to transform the barn, the very barn that was bombarded by a storm. 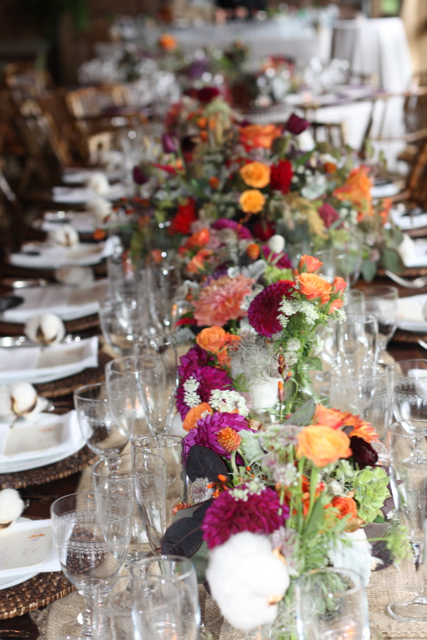 Could I have done this wedding without Design Cuisine? Perhaps so, but I would not have wanted to!!! Their team was amazing and their food was perfection. Alice and Mike and their guests dinned on shrimp and grits, corn slaw, tenderloin, crab cakes, corn bread, and an endless list of southern delights. I needed Design Cuisine as much as I needed Evan. I also want to thank Julie Renee Massie for being our photographer, and my in house planner Kristin for the incredible work that she did to bring this event together. 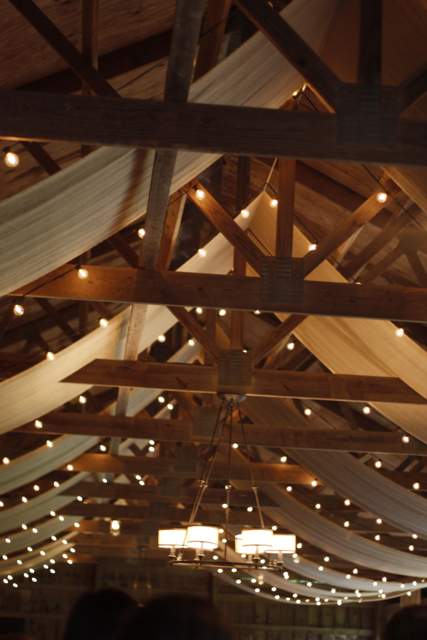 Also many thanks to Peggy and John Rust of Murray Hill, Murray Hill has always been one of my favorite venues, with the addition of the barn to this property I am totally in love!!! Happy married life Alice and Mike. 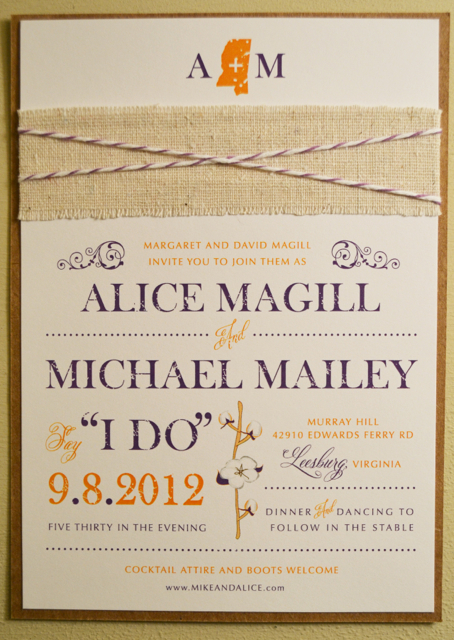 We loved designing your wedding!!! Oh my goodness Holly – how breathtaking and amazing! You give such heart and soul to your brides. Congratulations to you and your team!!! 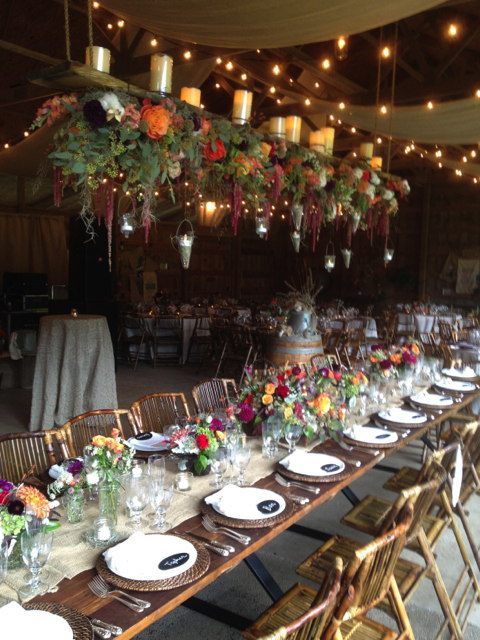 Holly that head table and floral chandelier are absolutely stunning!! Gorgeous work, as always! Holly, I just can’t thank you enough! You explained so perfectly how everything actually went as it was supposed to- even though it may not have seemed it at first. That chandelier is ridiculous! LOVE IT! You are so talented and I love reading your posts! You are really Creative. 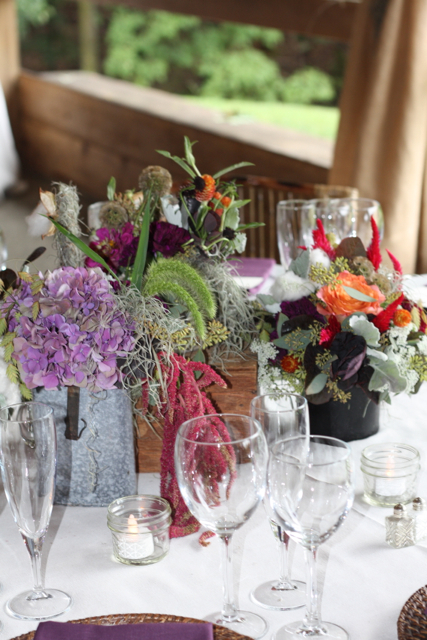 You made the Wedding exotic by adding the freshness and brightness of fresh flowers. The photographs looks so heartening an enlightened. Three Cheers to you Guys. Will Really love to witness such event in my life.